We've heard from a number of people who want to pursue the CFRE credential that one of the obstacles they have is the cost of study books that are recommended as providing the knowledge base necessary to attain the credential and for performing well on the exam. 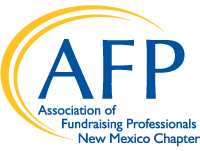 To address this, the AFP New Mexico Chapter has provided funding for and partnered with the New Mexico State Library in Santa Fe to establish a fundraising collection that our Chapter members, or anyone interested in learning about fundraising, can borrow. If you are in Santa Fe, the books are available for check-out. All New Mexico residents are eligible for library cards from the State Library. If you are not in Santa Fe, simply go to your local public library and ask that the desired book (or books) be borrowed from the New Mexico State Library by InterLibrary Loan (ILL). The State Library will mail the books to your public library. When your library receives the books, you will be contacted to pick them up. The check-out period is for 4 weeks. Renewals are allowed. When you are finished, return the books to your local public library and the library will mail the books to the State Library. We would like to thank the New Mexico State Library, and particular, Laura Calderone, Reference Service Manager, for working with AFP New Mexico in helping to provide this outstanding educational fundraising resource. Prospect Research (2nd ed.) (2007) by Celia Hogan and Philip H. Geier Jr.